So rich in vitamin C and great for our breath! 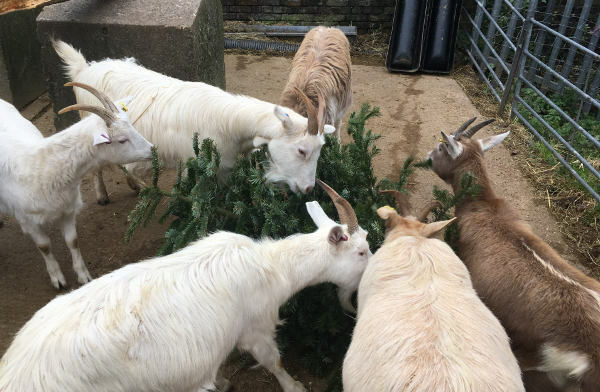 At the start of the new year we asked people through our Twitter and Facebook accounts to bring their real Christmas trees to the farm to feed to some of our animals. We were, and remain absolutely astounded at the phenomenal reaction to the posts. 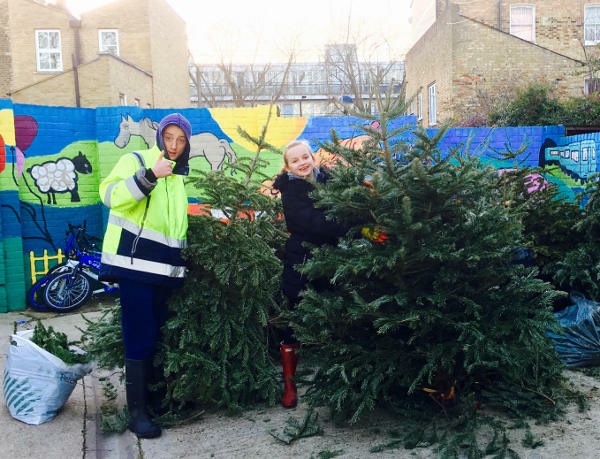 We reached record-breaking amounts of people on social media and received a small mountain of trees in response. 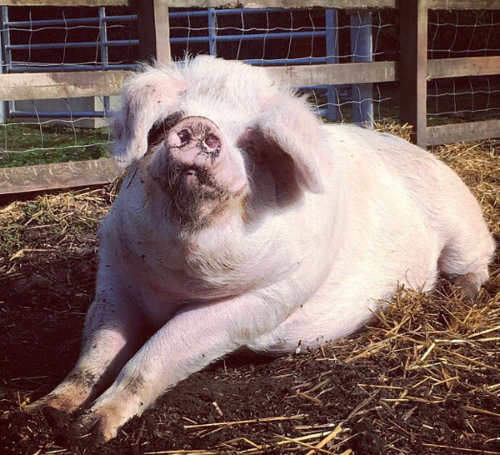 We would like to say a gigantic thank you to everyone who liked, shared, retweeted and generally spread the word on our behalf. You’ve warmed our hearts, raised awareness on recycling and most importantly made our goats the happiest in London, possibly the world! They give the goats lovely pine fresh breath! 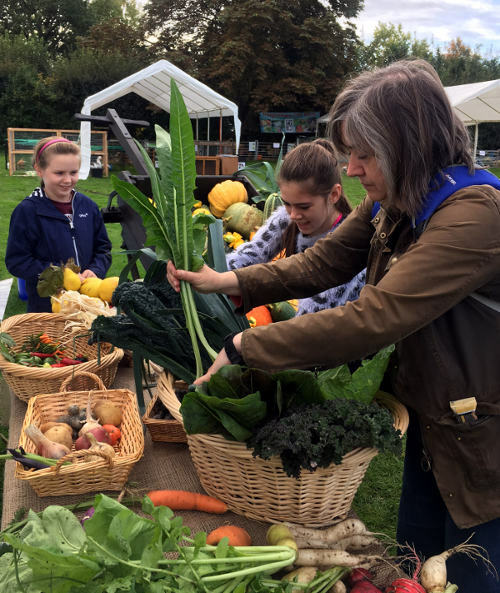 September brings a big event in the calendar of city farms and community garden projects in the form of the London Harvest Festival at Capel Manor Horticultural College. This year was the 19th festival, and my third. Some of our young farmers have been for five years or more. There were some, along with new members of our staff and volunteers, who were attending for the first time, and organisers and competitors who’ve been to all nineteen. All were up at the crack of dawn grooming animals, picking vegetables, arranging tables and practicing their best smile for the judges. Setting up displays first thing! With the animals, equipment and older kids in the lorry, and everyone else in a hired minibus, we closed the farm up and left. In the cab, animal facts were nervously recited and tested as we headed up the A10. It had been rather wet underfoot the night before and the lorry got into an almost disastrous muddy predicament causing a few sweaty palms (and some very deep tyre tracks in the grass), so we unloaded just off site to be sure the big green horsebox wouldn’t be a feature in the arena for the day. The show started at 10am, which gave us an hour and a half to get everything in its place in our allocated animal marquee and the horticultural tent. With all hands on deck, we were ready to go when the animal categories kicked off at showtime. 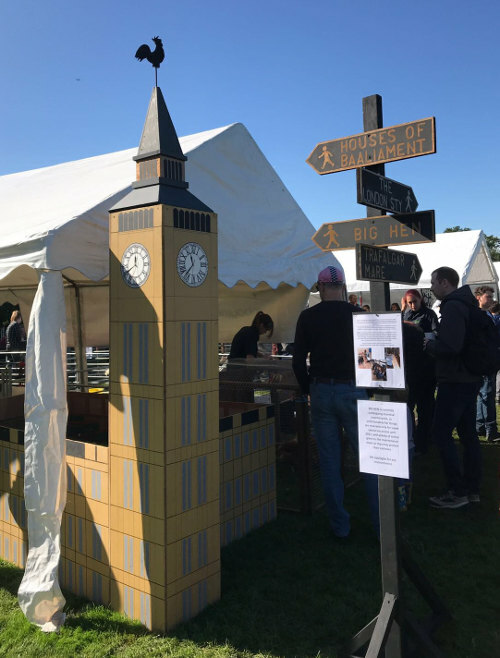 Whilst all eyes were on the first competitors in the small and large arenas however, several volunteers were still frantically yet artistically arranging our exhibits in the main tent. 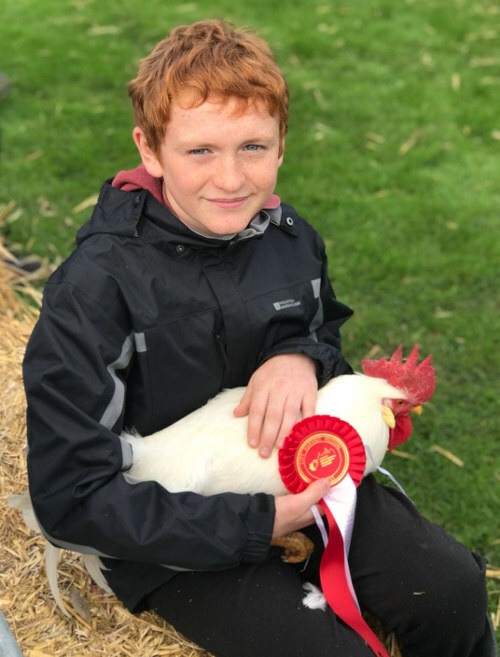 Like a well-oiled, if slightly behind schedule machine, we were all done and breathing a sigh of relief just as it was announced outside that our Leghorn cockerel Kingsley had taken first place with young farmer Elliot, and Zak and our Crested Legbar Dorothy a gallant fifth! Claire and the kids were so thrilled they ran to us in the tent to show us the rosettes. It was the start of a thrilling competition; you could just tell. The show is divided into two halves, with a fun farming quiz in between that all the kids take part in. 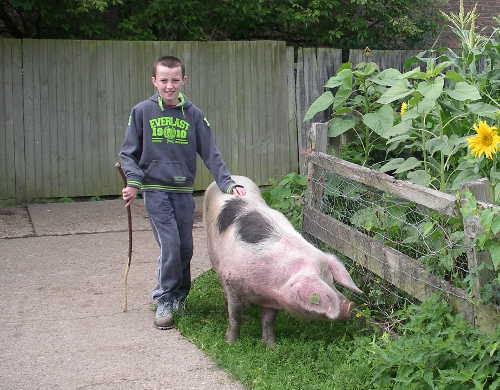 Part one is dedicated to the specific animal groups, whilst part two focuses on the Best Young Handler and Supreme Handler groups and the more fun elements such as Animal With The Most Character. This year, we took four chickens, three goats, two guinea pigs and a goose, and we made sure all of our young farmers got the chance to show at least once. 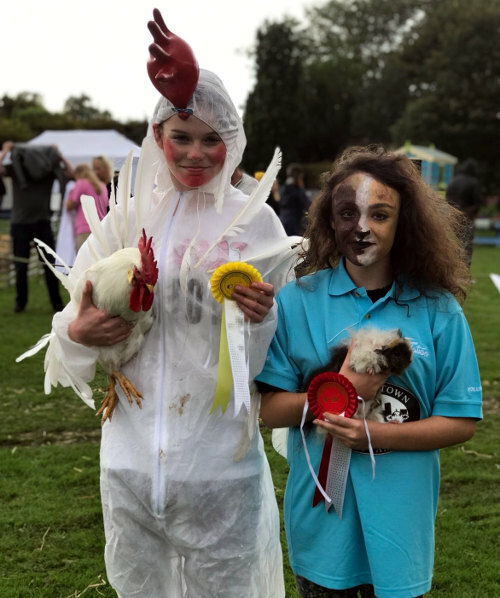 Chris from Hackney City Farm once again expertly played his role as compere, and as he called out for the contestants in each category, Claire and Hannah ushered our kids to the right arena with the right animal and a great team of supporters ringside. Everyone looked really smart in their new matching turquoise farm T-shirts, and they definitely made someone easy to find if they’d snuck off across the field to get a quick burger or make a clay pot. This year, our retired stockman John Langan was on the animal judging panel for the first time, so there was a familiar face in the ring to greet our young farmers and their charges. As expected, he was quick with his trick questions and jokes, and definitely added a certain je ne sais quoi to the proceedings! And as usual, the KTCF massive provided the biggest cheers as our rosettes came in thick and fast. Over in the Horticultural tent, the judges began working their way around the many tables laden with produce, preserves and plants. This year we entered as many categories as possible and between us had come up with some wonderfully creative exhibits, as well as mouth-watering jams and a good-sized pumpkin. The hard work paid off and we took an excellent seven certificates home with us; 1st place for the planted up birdcage for Unusual Container, 1st for Best Sunflowers with Valerie’s complete 2.5m stem and deadhead towering over the displays, 1st for a picnic hamper packed with a wide variety of herbs for Container Of Herbs, and 1st for our Beekeeping Display. 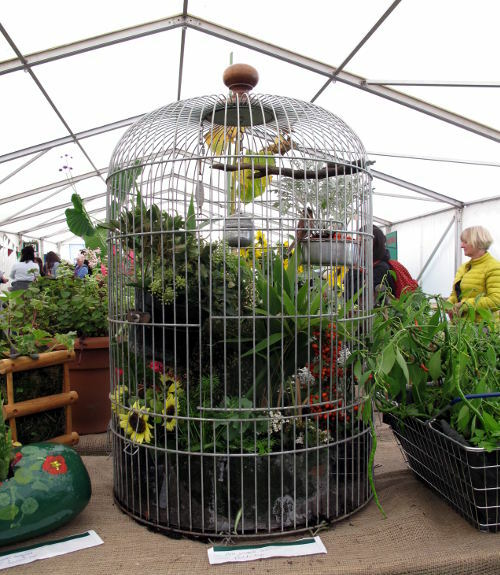 Our handmade chicken shaped wire basket crammed with eggs got us 2nd place for Container of Eggs, our Seasonal Fruit and Vegetable display with our antique handcart at its heart won us 3rd place, as did the shrunken Japanese Zen garden in a tin bath for Large Mini Garden. Despite having been away at Veterinary College for her first week, our wonderful young baker Megan returned to London on Friday to stay up half the night with her fabulous mum Anne to bake delicious cakes and cookies to sell for us. The queue for goodies was out of the tent from the get-go, and they managed to clear a record profit which paid for our costs for the day. Over in the Have-A-Go tent, Simone, Trish, Pedro and Jean kept visitors entertained with fun crafts and activities such as felting pencils and poppy seedhead dolly making, alongside the potter’s wheel, apple crafts and herbal tea blending. After all that judging and parading and best behaviour, there’s a chance for everyone to let their hair down and get a little wild during the infamous Tug ‘O’ War contest! It begins with the under 16s and progresses to the overs. Unfortunately, we were unable to enter an adult team to the contest this year, but we had our strongest team to date in the youth department. They effortlessly pulled several farms out of the arena but were pipped to the winning post by a very evenly matched group of youngsters in the final rounds. Absolutely nobody, however, can boast a more supportive and vocal crew than KTCF, with all staff, volunteers and kids shouting encouragement to the point of hoarseness as they do every year! Once everyone got their breath back it was time for the final prize giving. There were trophies given for Best In Show for the most impressive display of fruit and veg, and to the farm with the most points in the Horticultural tent. We were pleasantly surprised when our name was called out for Best Educational Exhibit, a category we didn’t even know existed! 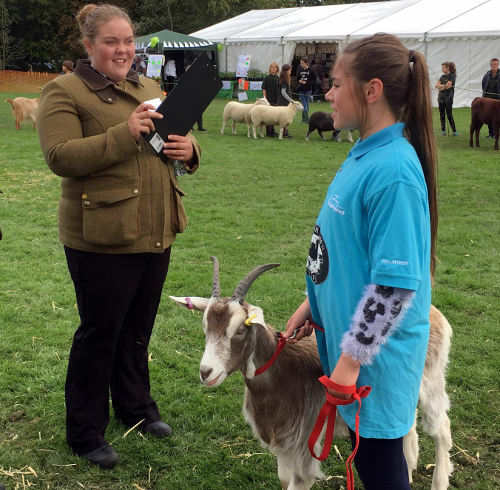 The surprise continued as the farm names were read out in reverse order to reveal the overall winner in the animal categories. As the numbers got smaller, our jaws dropped lower until we were announced as coming in third place! You can imagine the joyous screams and enthusiastic hugging! All in all, the day was an outstanding one for everyone involved. Our young farmers were absolutely phenomenal and made the day the record-breaking success that it became. As we made our way home in convoy, weary from the long hours but buzzing with adrenaline and pride, we knew this year’s Capel Manor Festival was going to be a very hard one to beat. Hen and guinea pig look-a-likes – 2 wins!